Leisuredays offer specialist insurance for static caravans, holiday lodges and chalets, park homes and holiday homes. We have over 30 years' experience working in the caravan industry and work with a large number of the UK's leading holiday parks. We are renowned for extensive insurance cover benefits, first class service and great value prices. Our expert team of over 100 staff is on hand seven days a week and our policies come with a 24 hour claims helpline. "Positive people delivering brilliant customer experiences" is our vision statement. We invest heavily in staff training to make sure we give you the best service. Take a look at our short video to find out more about our values, which underpin the way we work. Our static caravan, park home and holiday caravan policies are underwritten by a leading UK insurer, RSA (Royal & Sun Alliance Insurance plc). We also offer gadget and leisure equipment insurance and emergency cover for your caravan or holiday home and main residence - these two policies are underwritten by UK General Insurance Limited on behalf of Ageas Insurance Limited. 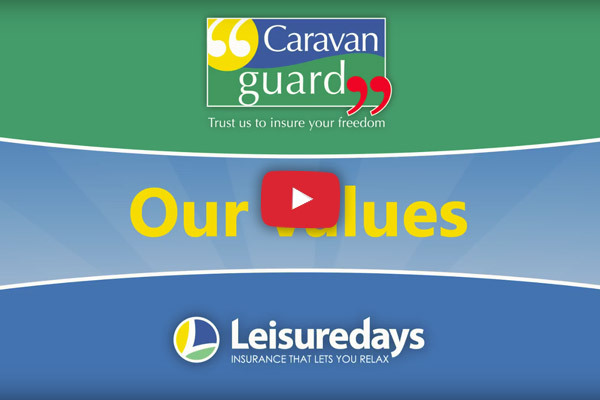 Our parent company Caravan Guard specialises in touring caravan insurance and motorhome insurance. Leisuredays is a trading name of Caravan Guard Limited (registered in England number 4036555). Caravan Guard Limited is authorised and regulated by the Financial Conduct Authority. We have 269 customer comments on independent review site Review Centre, with 92.9% recommending Leisuredays. 96% of customers surveyed in June 2015 agreed that Leisuredays offer good value for money. Really knowledgeable staff who want to help you get the right policy at the right price for you.